In an industry that insists that most actresses remain giggly, pliable and princessy well into middle age, Winslet has somehow avoided that pigeonhole entirely. She doesn't play girls; she never really has. She plays women. Unsentimentalized, restless, troubled, discontented, disconcerted, difficult women. And clearly, it's working for her. 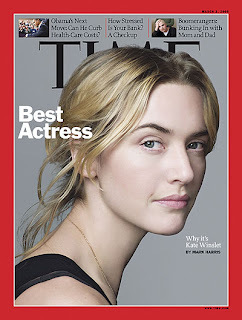 Her two most recent performances — as Hanna Schmitz, the illiterate former concentration-camp guard in The Reader, and as April Wheeler, the anguished, rageful 1950s wife and mother in Revolutionary Road — have earned her two Golden Globes, a Screen Actors Guild prize, a British Academy Award (BAFTA) and her sixth Oscar nomination, a benchmark that no actor so young has ever before reached. At 33, Winslet has become not only the finest actress of her generation but in many ways also the perfect actress for this moment. She's intense without being humorless. She's international in outlook (though raised in Reading, England, in a middle-class family of working actors, she now lives in New York City and won those Oscar nominations for playing three Americans, two Brits and a German). She's ambitious but cheerfully self-deflating, capable of glamour but also expressive of a kind of jolting common sense. She has a strong professional ethic, which she somehow balances with her domestic life (she and Mendes have a son, Joe, 5, and Winslet has a daughter, Mia, 8, from her first marriage — she takes both kids to school most days). And, cementing her status as an icon of the Era of New Seriousness, she really likes hard work. Assuming she's paid her taxes, are there still any openings in the Cabinet? What are you favorite Winslet movies/roles? I especially love her in Heavenly Creatures (1994), her first major role, and Eternal Sunshine of the Spotless Mind (2004), which is just generally an amazing film. I adore Heavenly Creatures, Sense and Sensibility, and Titanic. I know Titanic is overexposed, but that role may be her best.